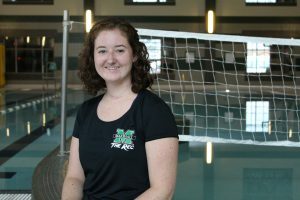 Learn more about the highly-qualified Swim Instructors at the Marshall University Recreation Center. 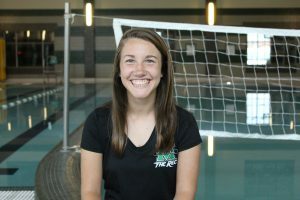 Alyssa Chapman is a Junior at Marshall University studying Exercise Science. She has been a certified lifeguard for 5 years and began teaching lessons with the Marshall Rec 3 years ago. Her favorite part of working at the Rec has been the people she works with. Alyssa enjoys working with kids and seeing them progress through a session. She specializes in Preschool, Level 1, and Level 2. Emily Hayslett is a Sophomore at Marshall University studying Public Relations. She has been swimming for 14 years and recently became a certified lifeguard this year. Her favorite part of working at the rec is the efficient and friendly environment. Emily enjoys teaching swim lessons and watching students progress from being uncomfortable in the water to become a proficient swimmer. She wants her students to learn to enjoy swimming as much as she does. She feels she is best at teaching kids under 10, and levels 3 and under. 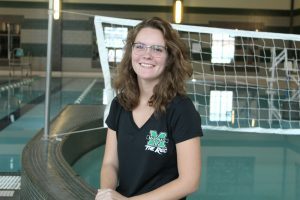 Morgan Karnell is a Senior at Marshall University studying Biology. She has been swimming for as long as she can remember and lifeguarding for 6 years. Her favorite part of working at the rec has been the friends she has made. Morgan finds it fun to be around kids and feel involved in the community when teaching lessons. She specialized in teaching preschool and swim tots classes. Emily Kuhn is a Sophomore at Cedarville University studying Nursing. (She is available in the summer for swim lessons at the Marshall Rec). She has been swimming for as long as she can remember and began swimming competitively 5 years ago. 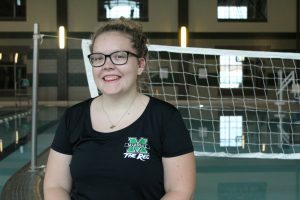 She recently began lifeguarding in the Summer of 2018, which is also when she began teaching swim lessons. Her favorite part of working at the rec is the friendly community of both patrons and co-workers. Emily loves to see students enjoy swimming as much as she does and seeing them progress over the course of their lessons. She specializes in helping hesitant kids get more comfortable in the water and teaching breaststroke to adults. Cassidy May is a 2nd-year graduate student at Marshall University studying Communication Disorders. She has been swimming since she was 4, and began swimming competitively at the age of 8. She has been lifeguarding and teaching swim lessons for the past 7 years. This is her 5th year working at the rec and finds it a joy to work at such an amazing facility surrounded by amazing people who make work more enjoyable. Cassidy enjoys teaching swim lessons and passing her love for swimming along to her students. She loves to watch children and adults of all ages learn essential safety skills and/or proper stroke techniques, gain confidence in the water, and progress through a level. She is comfortable teaching any ages and levels, from swim babies all the way through adult stroke development. Tori Miller is a 2nd-year graduate student at Marshall University studying biomedical research. She has been swimming for 9 years and lifeguarding for 8. 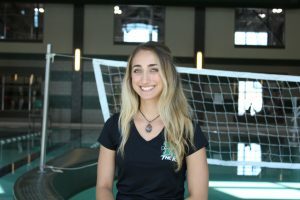 Her favorite part of working at the rec is being a part of the Marshall community outside of the classroom and interacting with new people. Tori enjoys seeing improvement in students through each lesson and helping students become comfortable and relaxed in the water. She feels comfortable teaching all ages and levels, and specializes in teaching advanced swimmers in levels 3 and above. Marissa Miluk is a Senior at Marshall University studying Dietetics. She has been swimming for as long as she can remember. She began lifeguarding in 2009 and began teaching swim lessons in the summer of 2017. Her favorite part of working at the rec has been the leadership opportunities, friends, and the positive sense of community. 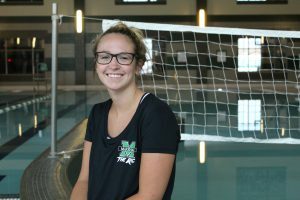 Marissa believes it is very important to know how to swim for water safety reasons and loves to watch students accomplish skills they never thought they could do. She enjoys teaching all ages and specializes in levels 1-4. 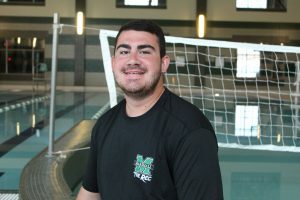 Vincent Murphey is a Sophomore at Marshall University studying Nursing. He has been swimming for many years and swam competitively for 2 years. He has been a lifeguard and teaching swim lessons for 5 years. His favorite part of working at the rec has been getting to work in a good community of coworkers. Vincent believes that everyone should learn to swim, as it is an important life skill and enjoys seeing students move up levels in swim lessons. He enjoys teaching all levels, but specializes in levels 3 and below. 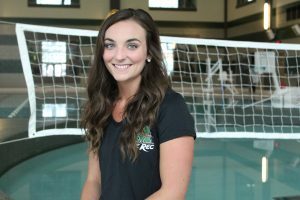 Kathryn Staats is a 4th-year student at Marshall University studying Business Management. She has been swimming for 12+ years, lifeguarding for 6 years, and teaching swim lessons for 8 years. Her favorite part of working at the rec has been the community and opportunities the rec has brought her. She loves to teach swim lessons and enjoys sharing the knowledge and techniques she has learned with students. Her favorite part of teaching is seeing improvement and making students proud of themselves and their swim development. She is comfortable teaching all ages and levels, and specializes in teaching levels 4 and above, with the swimmer’s goal to swim competitively.